By popular demand the Dark Matter Awareness Week will be extended for an Extra time period until the end of January 2011. To join the Extra time January session click here. Dark Matter Awareness Week is envisaged as a worldwide effort for disseminating specific information about one of the most pressing problems and elusive aspects of astrophysics, high-energy physics, cosmology and relativity. During the first week of December 2010 the talk 'Dark Matter in Galaxies' will be presented at your institute by one of your colleagues. The content of the talk will be at the level of a journal club talk, and in a few cases will be at the level of a review talk. 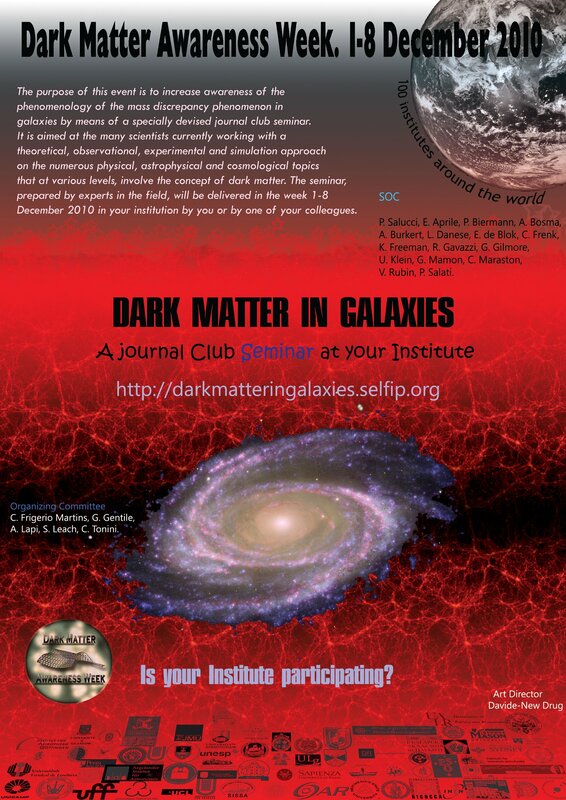 The overall purpose of this event is to increase the awareness of the phenomenology of the mass discrepancy problem in galaxies amongst the many scientists currently working with a theoretical, observational, experimental and simulation approach on issues involving dark matter or its alternatives. Why an awareness week ? The distribution of matter in galaxies of different luminosities and Hubble types, as inferred from observations, plays an important role in cosmology, extragalactic astrophysics, astroparticle physics, as well as in a number of issues in high-energy astrophysics, galactic astronomy, star formation and evolution and general relativity. Notwithstanding the general successes of the LambdaCDM scenario in explaining the structure and evolution of the universe, there is a growing conviction that the structural properties of the dark and luminous components in galaxies hold important clues about the nature of dark matter and the processes that are responsible for galaxy formation. This initiative aims to be serious effort to communicate results from those scientists working in the field of galaxy structure, to those scientists engaged with the dark matter problem in astrophysics, astroparticle physics and cosmology. DMAW 2010 has an ambitious and specific aim. It should be emphasised first that the goal is neither to disseminate amongst physicists and astrophysicists the evidence for a dark component in galaxies, nor to overstate its scientific importance compared other cosmological and astrophysical issues. Regular meetings, workshops and conferences are instituted to achieve these goals. The aim of DMAW 2010 is instead to provide scientists working in many different areas related in several different ways to dark matter, an improved knowledge of the phenomenology of its distribution in galaxies. Colleagues working in the field of galaxy structure are not the target of the DMAW 2010 initiative. Instead, we ask them to join in as protagonists, by preparing and delivering the seminars and by contributing to shaping the DMAW 2010 reference materials.